Burn, diabetic and pressure wounds cause debilitating pain and can lead to serious health complications for patients. The cost of treating these conditions worldwide is at least $25 billion per year. Despite current advances in the field, existing therapies for hard-to-heal wounds have yet to improve outcomes for patients. In order to solve this problem, Dr. Aziz Ghahary and his team are developing an infection-fighting liquid skin substitute made of natural skin proteins. Dubbed MeshFill, the substitute can be poured over a burn, diabetic or pressure wound. Within 20 minutes of application to the wound site, it solidifies at body temperature to create a scaffold over which skin cells can travel preventing infection and allowing the skin to close. Used in conjunction with a slow-release anti-scarring agent also invented by Dr. Ghahary, MeshFill eases patient suffering, speeds recovery and, for burn survivors, reduces the prospect of disfiguring scarring. 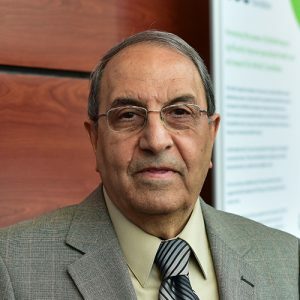 Dr. Aziz Ghahary has made ground-breaking advances in the treatment of burns, diabetes, arthritis and chronic wounds, translating his discoveries in the lab to novel technologies ready for clinical use. Dr. Ghahary’s innovations in chronic wound and burn wound healing have paved the way towards significant improvements in patient care. One of his innovations, FibroStop, an anti-scarring drug that Dr. Ghahary developed, has recently passed its Phase 1 clinical trial for clinical use. Another one of Dr. Ghahary’s innovations is MeshFill, a liquid skin substitute used to treat chronic wounds, a complication of diabetes and spinal cord injury. Unlike skin grafts, which leave cavities in chronic wounds that make them susceptible to secondary complications, MeshFill completely fills up tunnels and void areas in non-healing wounds particularly those seen in pressure ulcers (bed sores), providing a scaffold for new cells from the edge of the wounds to grow. Currently in use in a pilot clinical trial, MeshFill can be transported long distances in powder form for wound care in rural areas or in developing nations.